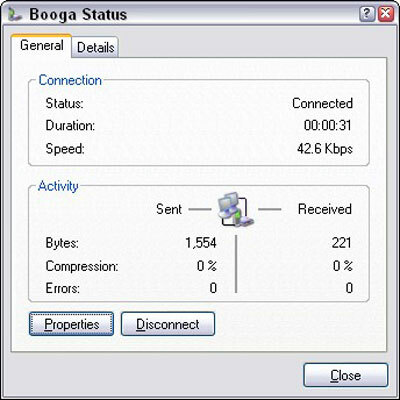 Unlike the always-on broadband connections, you must always disconnect your laptop from a dialup connection when you’re done using the Internet. Just as you said “Hello,” you must always say “Goodbye.” This is something you may forget, especially when you use dialup on the road and have broadband at home. The simplest way to disconnect the modem from the Internet is to right-click the little modem guys in the notification area. Choose the Disconnect command from the context menu that pops up. You can also just double-click the modem guys, which displays a Status dialog box, similar to the one shown above. From there, you can click the Disconnect button to end your Internet session.